It’s a significant word. Community represents connections and support for one another. Whether a community is based on location, or common interests, it brings a diverse group of people together to learn, grow, and build lasting relationships. At AIM, we value our community members. Community provides natural supports to people with disabilities to learn, develop their individuality, and to live as independently possible outside of paid supports. From our neighbors to local organizations and businesses, the people and families we support are most successful with an inclusive and involved community. Collaborations with other community organizations and businesses are key to the success of the people AIM supports. By working together, we are all able to build awareness, support the potential of people’s abilities and cultivate their independence and acceptance in the community. Rebuilding Together helping us to modify homes to make environments that are more accessible for the people and families we serve, and helping with spring clean-ups at some of our Residential Programs. Glens Falls Tae Kwon Do adapting their classes for people in wheelchairs with limited mobility, and even widening their sidewalks to be more accessible! Skidmore College providing intelligent and thoughtful interns to our Clinical and Public Relation Departments. As well as, starting the new “AIM to Dance” program to teach people with disabilities dance and gain further exposure to the arts. Healthy Living Market & Café providing employment and training opportunities for people with disabilities, as well as support for AIM fundraising events. The Children’s Museum of Saratoga creating the “Making Connections” program to bring together families and children with disabilities to build meaningful connections and lasting friendships. Dake Foundation for Children providing adaptive equipment in meaningful ways through a grant program to people with disabilities up to the age of 21. Today’s children are the future of our community. AIM Services, Inc. provides a range programming to children to foster growth and independence. AIM’s programs for children include Recreation, Enhanced Respite, Family Education Training (FET), Family Support Services, and more. The success of these programs would not be possible without the support of organizations like Dake Foundation for Children. Celebrating 15 years helping the community, Dake Foundation for Children has played an essential role in the lives of the over 1000 families AIM provides services to locally. 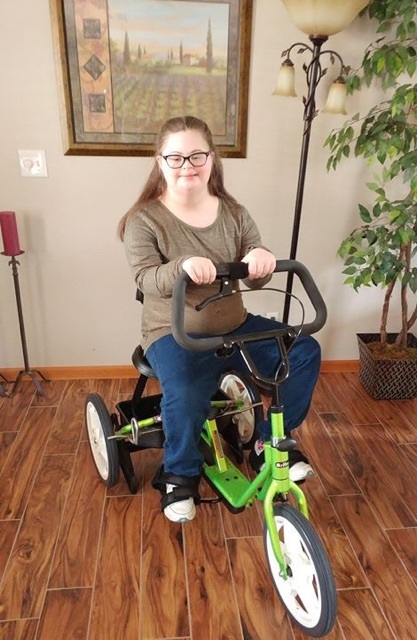 Over the past three months in 2018, Dake Foundation has helped over 30 families supported by AIM Services, Inc. by providing adaptive equipment, bicycles like the one pictured below, and more. Adaptive equipment and tools provided by Dake Foundation are key to fostering the most successful future for our children and our future community. Photo courtesy of Dake Foundation for Children. Hear the full interview with Executive Director of Dake Foundation for Children, Matthew Stevens: Listen Below! Interested in ways you can get involved with AIM Services, Inc.? Visit our Get Involved page.